If the Bishop has no crosier is he or she any less a Bishop? I hope not! But, for some weeks now I have not had a crozier. “What is a crozier?”, you might ask. Well, putting it officially, the crosier is the symbol of the governing office of the Bishop. 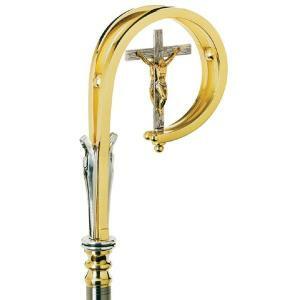 The crozier is shaped like a shepherd’s crook. A bishop of the church bears this staff as “shepherd of the flock of God”. Interestingly, the traditional explanation for the form of crosiers is that the crook at the top symbolizes the Bishop’s obligation to draw back those who stray from the faith and the staff itself symbolizes his obligation to stand as firm support for the faithful. It is considered to be both a rod and a staff (Psalm 23:4): a rod for punishing the recalcitrant, and a staff for leading the faithful. There are a few names associated with it including, “staff”, “crook” and even “battle axe” as one marvellous old legend holds in Moosonee when one former Bishop, upon vesting for service asked the Layreader “Now, where is that old battle axe?”, whereupon the poor Layreader, thinking the Bishop was referring to his wife, declared “Oh Bishop, she’s sitting out in your car”!!! Well, all of that is fine, but the present Bishop of Moosonee has no crosier. Thankfully, the situation is not permanent. Actually, I have two! The Diocesan Crosier, which sits next to the Cathedral (Bishop’s chair) in the Cathedral, was originally given to the fourth Bishop, John Anderson. It is a simple yet elegant design of silver, with a small crook that includes a tiny Celtic cross within it and an ebony staff. Since Archbishop Anderson’s day, each successive Bishop has had a silver band affixed to the staff that bears their name and years of service. Through the many years of its use, it has had its share of battered moments. At one time it came apart into four sections for easy transport. Alas, it kept falling apart and had to be fused together. On one occasion the staff came apart just before the Bishop needed it for a blessing. It was one of those hilarious moments to see three clergies on their knees trying to put the staff together in time! In the end, the Bishop just ignored the staff and the clergy! It now sits permanently in the Cathedral and is used only at Diocesan celebrations. Every church with or without a sitting Bishop should have a Crosier next to the Seat of the Bishop’s Throne. That should be there at all times and used by a visiting Bishop until the service is ended or when the Bishop leaves the church. Every Crosier has its unique features and carries a special meaning and purpose. I carry my own “travelling crosier”. I am very proud of taking it with me wherever I go should I have the need to use it at the visiting church. Of the collection, one is my consecration Crosier that is only used at special times. This is sacred to my heart and only for the proper purpose.